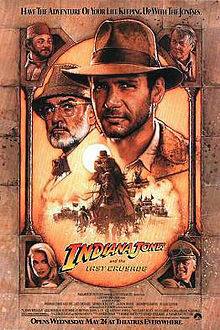 I’m not sure what took me so long to finally see Indiana Jones and the Last Crusade. I had watched Raiders of the Lost Ark and Temple of Doom pretty much back-to-back, but over a year has passed since then. Perhaps my general disdain for Temple of Doom had something to do with it — after that subpar effort, I was skeptical that the third entry could achieve the greatness of the original. Little did I know that I would enjoy the hell out of the finale, which in some way even surpasses its legendary beginning. 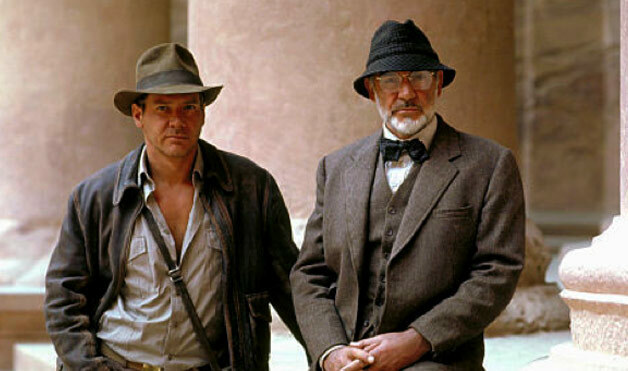 Set in 1938, Indiana Jones (Harrison Ford), now teaching at Barnett College, is informed that his father, Henry Jones, Sr. (Sean Connery), has gone missing while searching for the Holy Grail. Knowing that his father must be in trouble, Indy travels to Venice, Italy to meet with a colleague, Dr. Elsa Schneider (Alison Doody). After a thrilling trip through rat-infested catacombs, the duo learn that Mr. Jones was abducted by the Nazis and is now held in a castle near the Austrian-German border. 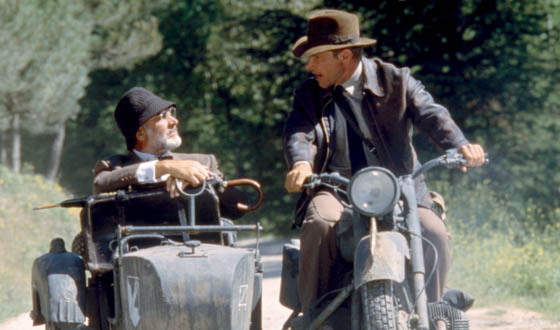 This soon becomes a globe-trotting endeavor in which Indy races to find both his father and the Holy Grail, all while fending off those evil Nazi bastards. At this point, it’s Indiana Jones 101, but the Last Crusade is most enjoyable thanks to its near-perfect casting. Harrison Ford and Sean Connery have terrific chemistry, and they are a lot of fun to watch together. Although Connery is only twelve years older than Ford, he looks much older in the film, and he does a great job adding comic relief to the non-stop adventures on screen. I’ll take him over Short Round or Willie any day. Old favorites Marcus Brody (Denholm Elliott) and Sallah (John Rhys-Davies) make welcome returns, and the new love interest Elsa is enjoyable as the icy cool blonde. The Last Crusade has a number of memorable moments as expected. Two obvious highlights are the aforementioned trip through the catacombs, and the epic tank chase en route to the Holy Grail. Also, who can forget the absolutely ridiculous (and awesome) cameo from Adolf Hitler? This is a film that revels in its over-the-top adventures and has a good time doing so. I feel I would need to revisit Raiders of the Lost Ark to determine which I liked more, but to say I enjoyed the Last Crusade would be an understatement. This film blew away my (admittedly reserved) expectations, and it’s one that I feel I may enjoy even more on subsequent viewings. Now, the question is, dare I risk tainting these memories by watching the fourth movie? As much as I adore Raiders, this is still my favourite of the Indy adventures Eric. Like you mention, the chemistry between Ford and Connery is just Gold. This is a film that has it all. Absolutely, Mark. This one is just so much fun from beginning to end. Yep, it doesn’t get much better than Connery and Ford. What a great pairing. Wahoo!! Yeah, what took you so long? Ahah, well better late than never I suppose. Glad you love this so much Eric, it’s one of my all time faves. Ford and Connery are such a brilliant combo, sooo entertaining. And the supporting cast, esp Elliot and Rhys-Davies are both wonderful as well. I vote “Raiders” #1 by a hair. Mainly because without it the other films would not exists. Very good point, Victor. Hard to argue with that logic. Nice! Not a fan of Temple of Doom myself, but I know it has a big following. I love this film, and it’s very close to Raiders in my opinion. I agree that Temple of Doom isn’t as strong a film, though I still enjoyed it. As for the fourth one… it’s divisive. I’m one of the ones who enjoyed it, and I think a lot of its negative reputation is just the internet feeding on itself. It was successful, but audience reactions were split, and now it’s become unpopular to admit you liked it. I do suspect a lot of the backlash has to do with it coming so far after the other films, and people not quite getting Indiana Jones in the first place (there is nothing in IJ4 that is out of place for the series. Nothing.) Since you’ve come to the whole series late, you might enjoy it better than somebody who has a long-but-unexamined love of the series. Alright, I was hoping someone would answer my question! Thanks, Morgan. I had a feeling that most of the negative reactions would come from those who were diehard fans, preferring to leave the series untouched. I’ve noticed the same thing with Star Wars fans. Though I loved the first Star Wars as a kid, I have no emotional attachment to the series, so perhaps I won’t hate the “new” films as much as everyone else. I haven’t seen any outside of the original trilogy. I’ll go into Indy 4 with an open mind. I’ve always loved Last Crusade. It was more lighthearted than Temple of Doom and seemed to rekindle the joys of the first film. Sean Connery was also a great piece of casting. Completely agree with everything you said, Dan. It seemed a better fit with the first film than Temple of Doom. Thanks Vinnie. A close second for me. I loved this movie too, I completely agree aobut great chemistry between Ford and Connery, they were wonderful together. Also Alison Doody is so lovely! Definitely. I wasn’t sold on Doody’s character at first, but I grew to like her. I didn’t like this movie to be honest. I have watched it many times and just cannot get into it. I kind of feel the same way about Temple of Doom, though I only saw that once. I always come away with a mixed impressions towards Temple after each viewing. I feel like the first movie was great, but the sequels become disappointing as they were released. I could be assuming, but maybe the subsequent sequels lack the mystique the first film had. I could see that. It’s always hard to follow up a wildly popular movie, but I thought the Last Crusade did a great job at capturing some of the magic from the original. I think Sean Connery’s performance really helped in that regard, as I liked him a lot more than Indy’s companions in the Temple of Doom. Wow, didn’t know Indy 4 has that high of a RT score. Pretty surprising considering its reputation these days. Thanks for the info, Chris, I think I’ll check it out with lowered expectations.